At long last the wait is over! I have visited my favorite farmers’ market fish monger for weeks, hoping to find the familiar crates of red-shelled crustaceans that religiously appear in late fall. Each week I got bupkis. Nada. No fresh crabs–anywhere. Like a junkie, I stalked my usual suppliers looking for a fix; haunted by the promise of sweet, sensual Dungeness meat dripping with melted lemon-garlic butter. Sadly, there is no support group for this kind of craving, and the thought of facing the New Year “cold turkey” (literally left-over from the holidays) was giving me the shakes. Crab has been a New Year’s Eve dinner tradition at our home for many years. Nothing compares to tucking in at a table filled with heaping bowls of Pacific Dungeness. We’d take our time picking the creamy flesh from its protective sheath, savoring every bite and mopping up the juice with a thick slice of crusty sourdough. Absent our beloved crab, I opted to make lasagna to ring in 2013. It was good, but it just didn’t feel like New Years. I know we weren’t alone in our lament. The opening of crab season on the entire West Coast has been delayed due to shell conditions caused by a late molt. Apparently, crabs outgrow and shed their shells (who knew? ), requiring time to flesh out and fill in their new armor. Pre-season tests conducted by the Department of Fish and Wildlife determined the crab population had not achieved desired “pick out” standards for meat, so the harvest was pushed back. 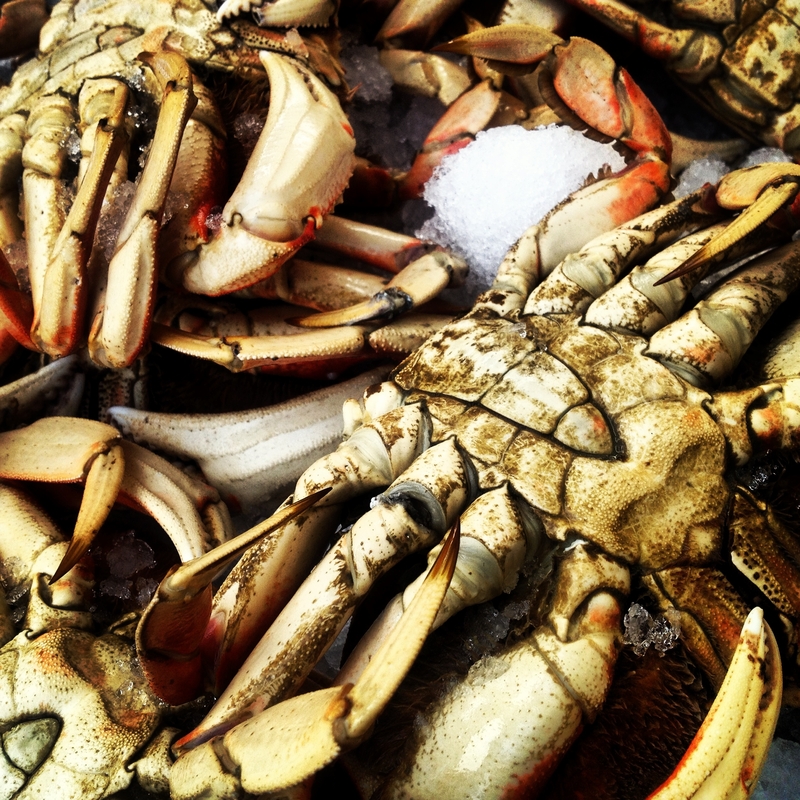 Then, last Sunday, when I had all but given up hope, they appeared at farmers’ market–extending beautiful, briny claws from their icy tubs–like waving red flags at a bull. Their scarcity has driven up the price a bit, but I had waited long enough. I plucked two heavy specimens from the group, flinched a bit when I paid for them, and headed triumphantly home. 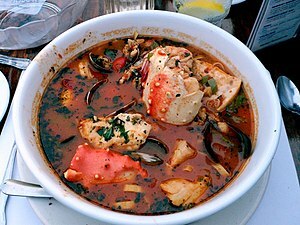 My friends Chris and Scott make a homemade Cioppino to die for. Those who have tasted their version of this hearty, one-pot seafood stew still rave about the experience. They were kind enough to share the recipe with me, and allow me to pass it on to my readers. It’s a classic way to showcase Dungeness crab in season. Enjoy! 1 large cooked Dungeness crab (about 2 pounds), cracked and cleaned, still in shell. 1 dozen mussels OR clams OR oysters OR a combination of those, depending on what looks good. ~In a large pot, melt butter and olive oil over low heat. ~ Sauté celery, onions, and garlic until soft and fragrant (about 5 minutes). ~Add all other ingredients EXCEPT the seafood and simmer on low heat, uncovered, for one hour. Add a little water if the sauce becomes too thick. Adjust seasonings to taste. ~Add the halibut and prawns. Simmer, covered, for about 5 minutes. Add mussels and simmer for 3-5 minutes more, until shells open. Discard any mussels that do not open. Add crab at the last, just to heat through. ~Ladle stew into large bowls and serve with crusty sourdough bread. Happy New Year, Karen! I was fortunate enough to enjoy Christmas brunch with my dear ones at the Tides in Bodega Bay. Their cioppino, served with crusty garlic bread, was DEEE-vine! Love crab- but can’t get those big guys. Gulf Coast crab will have to do me. So good when it is fresh.